(VEN) - Footwear exports to the US market recorded high growth of 30.21 percent in the first seven months of the year. Vietnamese footwear has gradually won consumer trust and increased market share. According to the General Department of Vietnam Customs, the US remained the largest market for Vietnamese footwear. In the first seven months of this year, footwear export turnover to the US reached more than US$2.3 billion, an increase of 30.21 percent compared to the same period last year. In particular, this figure increased by 30.87 percent in July alone compared to a year ago. In addition to garments and textiles, leather and footwear are seen as the potential sector that will benefit by free trade agreements. Footwear orders from importers such as the US, Japan and the EU have moved to Vietnam instead of China in recent two years. According to Vietnam Leather, Footwear and Handbag Association Secretary General Phan Thi Thanh Xuan, Vietnam has engaged in bilateral and multilateral negotiations to expand the market, making the country more attractive to foreign investors. 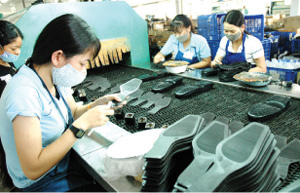 “Vietnamese footwear exports to the US market will witness strong growth in 2015,” Phan Thi Thanh Xuan said. Phan Thi Thanh Xuan said that the US paid special attention to corporate social responsibility, human right and consumer accountability as well as sustainable consumption and production. Therefore, businesses must meet strict requirements and regulations in terms of the environment and product safety. She also said that businesses should keep up to the date on the US market and upgrade technology in order to improve competitiveness. The leather and footwear sector has actively found material sources and products have basically met the requirements of the US, the EU and Japanese markets. However weak human resources and limited finance are considered the two difficult issues for businesses in expanding trading and production activities in order to improve product quality to meet technical standards. Vietnam Leather, Footwear and Handbag Association Secretary General Phan Thi Thanh Xuan said that the association has promoted links with US associations and sectors to introduce new regulations in terms of product safety, tax and customs procedures and the environment and update the latest information for businesses.